Welcome back to this series, in which we talk about business and technical aspects of several use cases that are relevant for the SAP S/4HANA 1610 release. In the last week we talked about Finance and this week we will focus on Product Lifecycle Management (PLM). In the digital era, everything becomes connected. In that manner, many of those items we use on a regular basis as part of our everyday lives inhere some sort of software. This is called embedded software. An embedded software is a computer software that is embedded in one or multiple products. It provides functions together with various hardware and systems. For example, an embedded software can be used to control or optimize the functions of the mechanical part or the electrical part of a product. One of the main challenges nowadays is to ensure that hardware and software can work together smoothly and to manage the different releases of the software. With current big trends, such as the Internet of Things, this is only getting more important. The new SAP S/4HANA 1610 offers a solution to overcome this challenge. With this release, product lifecycle management (PLM) becomes integrated to the core of SAP S/4HANA fully supporting all processes in embedded software and document management. Throughout the application, product lifecycle management data and processes have been streamlined and integrated. With the 1610 release SAP delivers two main enhancements: streamlined and superior end user experience together with additional functionalities. Various new SAP Fiori roles, such as system engineer, design engineer or recipe developer, have been created for the on-premise version. For every role, personalized and role-specific SAP Fiori launchpads provide a single entry point to access all relevant PLM apps. Due to this personalized launchpads, PLM professionals receive all important information centrally and therefore can easily see where they need to focus their efforts on. As a result, PLM professionals can work more efficiently. These functionalities are provided by four new product features: manage software constraints, manage product structures, check software compatibility in product structures and manage embedded software in product structure. 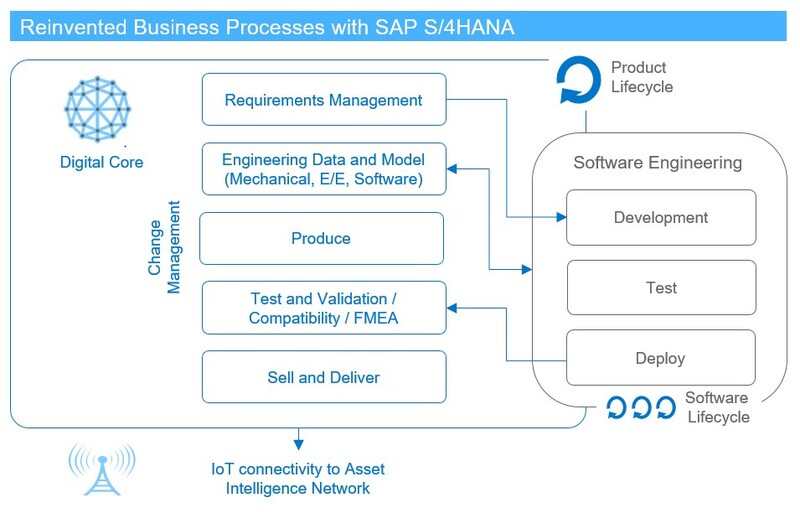 Employing embedded software management as part of SAP S/4HANA ensures the compatibility of software embedded in a product already early in the development phase. As a consequence, it is assured that all your products with embedded software function properly and smoothly. With the new search feature of this app, you can easily find the right documents even though you might have forgotten the “document info record” key to search documents. Also, with the new attachment service that allows easier handling of attachments, you can work more efficiently and ensure proper documentation. In a nutshell, with the SAP PLM application in SAP S/4HANA you can manage your embedded software versions so that product compatibility for easy deployment of embedded software across products and projects is ensured. This will guarantee that the specific requirements on the hardware and software are met so that it functions accurately. Furthermore, enabled by the key innovations in DMS, managing your companies` documents becomes easier and retrieving necessary information by using the search function is provided. Stay tuned when we take a closer look into the technical aspects of the Product Lifecycle Management use case in the technical view blog. Thanks Sven – where can I find more info regarding the new PLM & Embeddded Software functionality ? i am quite amazed with your blogs.. interesting..Thanks Sven. Good one.